Psalm 27:8 My heart says of you, "Seek his face!" 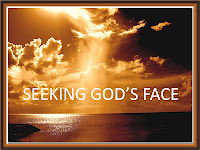 Your face, LORD, I will seek. Powerful few words. In other words. Before you do anything else. Speak to God. Speak your heart. Share with the Lord what is deep down inside. You will find that even though he (God) knows your heart, it is very therapeutic to do so. God loves you. He sent his very own son to teach us the way to the truth and the light. All we have to do is our very best. That is all.